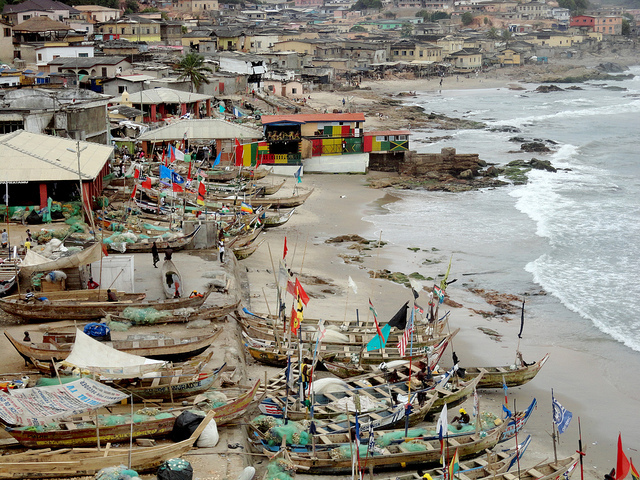 Ghanaian fishing boats. Photographer: Ahsleigh Lovette (via Flickr). This report* explores the current state of finance for climate adaptation and proposes practical, near term solutions to both fill in knowledge gaps and to increase investment. While many of the suggestions can also be applied in developed countries, which often face similar challenges in measuring and deploying adaptation finance, the focus of the report and selected examples highlight the role for developing country national governments and stakeholders, such as development finance institutions, local governments, and civil society organizations including academic institutions in supporting increased knowledge and investment in adaptation. The report benefits from discussions held during three adaptation finance focused workshops organized by CPI and adelphi in 2018 to present and discuss preliminary findings of this study. There is an urgent need to spur greater investment into climate adaptation and resilience, in both the public and private sectors. However, current investments in adaptation constitute only a fraction of what is needed to avoid costly and catastrophic future impacts. The measurement and disclosure of climate risk is the first step to developing strategies to address risk as part of all investment decisions. Regular assessment and disclosure also helps to measure the effectiveness of interventions over time. Tracking investment in adaptation and risk reduction is important to understand where investment is – and isn’t – happening. In addition, there is still little agreement on what qualifies as adaptation finance and how it should be measured. Adaptation activities are project and location specific, and they respond to specific climate vulnerabilities. Unlike mitigation activities, it is not possible to produce a standalone list of adaptation activities that can be used in all circumstances as adaptation investment often involves mainstreaming resilience into all investment decisions. Context barriers: which are specific to the market that is implementing the adaptation projects and related to the policy and institutional environment. This is particularly relevant for private capital, which is in part driven by the incentives generated by regulatory and policy frameworks. Gaps in these frameworks are frequently cited as constraining adaptation investments. and a lack of technical capacity to implement and maintain adaptation products. Internal capacity barriers: which can lead to a lack of companies offering adaptation products and services not operating at scale. The internal capacity of a product or service provider determines whether it is investment ready and whether it has the capacity to expand to new geographies or sectors, especially in developing countries. Increasing demand for climate adaptation services and products: such as through policy reforms that set rules for how businesses and government evaluate, disclose, and manage risk; funding market studies that describe the potential impacts of climate change for specific local geographic areas; and supporting product demonstrations. Sustaining suppliers of climate adaptation products and services to help them scale-up: such as through the development of technology and data standards that allow many actors to engage with each other in the climate risk market; and provision of data, such as basic weather and exposure data that are public goods which businesses can build upon to offer value added services. De-risking adaptation investment to address cost and information barriers: such as early-stage funding of new technologies before they are market-ready, and soft loans to infrastructure projects that add resilience into their designs at additional cost. This can also include direct investments into adaptation projects, particularly government assets. de-risk adaptation investments using different policy and financial tools. incorporating climate risk assessment requirements in infrastructure PPP contracts. and providing technical assistance and concessional equity to suppliers of adaptation products and services to better serve local markets. and offering technical assistance and catalytic finance to climate smart agricultural lending and index insurance initiatives. Micale, V., Tonkonogy, B., Mazza, F., 2018. Understanding and Increasing Finance for Climate Adaptation in Developing Countries. CPI.